Hey Jackie, send your photos to the Nova Scotia Museum. I once sent them an image of a carved rock I’d found at Polly’s Cove and they were able to tell me a bit about it. I bet they’d love to see your shots. How did you find the rock ? Thanks, Sybil, I’ll try them and see if they know about it. Maybe just someone from one of the cottages, marking a boundary, or trying to confuse people like me. We just found it as we walked the shore at Second Peninsula – we had walked past it many times, before we spotted it. Just curious – did you ever get any more information on the origins of this stone carving? The “markings” inside the serpent’s body look like Norse runic symbols, so if this was someone modern going to the trouble of carving it out to look “old” they did a rather fantastic job of it. I did write to the Nova Scotia Museum and got this reply. [Thank you for sending the photo of the carved rock at Second Peninsula. I have seen this one before. Based on the style of the design and the fact that it was produced with a metal tool I would say that it is modern, and likely produce by a local artist. Perhaps as you say, just someone having a bit of fun. I wish we knew who carved it. As you said, someone took a lot of trouble with it. Have you seen it? I’m glad I came back and saw the follow up on the carving, Jackie. How about take a pic of it and sending it to your local paper, to see if anyone knows its story. It really is lovely. So, while likely a 20th century creation, it still is a fascinating little art project that someone took the time to undertake in a pretty remote region of coastal Nova Scotia. I’ve spoken with the editor and Lunenburg reporter for the Progress Bulletin (the local newspaper). They were previously unaware of the stone’s existence and are equally curious as to who created it and why. Sorry, Patrick, I’ve just seen your comment. Wow – it couldn’t look much more like the link you sent! So, we know what it is, now it would be good to know who the clever person is who carved it. Hi I am a mason from halifax and may have a theory on who carved that stone. Where the stone appears to be granite, the artist would require special chisels which are quite costly and hard to come by for the average joe. i know of a family who runs a granite quarry in new germany which is not far from there, they would have the proper tools for the job and are from I believe Sweden to boot. I may be way off but you may want to talk to a lad named Tobias Laing. or Lang? Thanks for reading my post and taking the time to reply. What you say is very interesting. I see that the owners of the quarry are Lange, but can’t find a Tobias. I have written to the local paper to see if they will publish a photo of this stone and help find the carver. im tobias lange. but i didnt carve this one. mine are hidden elsewhere. This is very interesting. If I had to say I would reflect to the legend of Sir Henry Sinclair, the Earl of Orkney who had voyage with about 300 other Templar’s to the “New World” in 1395. Legend say’s that they had landed in Nova Scotia. Where exactly does this stone sit on the south shores of Ludenburg? I don’t think it has anything to do with Oak Island or the Knights Templar. The comment by Patrick Hirtle is the best so far. The link he gives, shows the Ramsund Carving from Sweden and the stone I found is almost an exact copy. We just need to know now who carved it. Where exactly is this stone? Is it still on the beach in the same location? I’d like to go look at it. 🙂 And have you learned anything further about it? Hi, It’s on the Mahone Bay side of Second Peninsula. If you go along Prince’s Inlet Road to Young’s Lane, then walk along the beach at low tide, you will find it along there. The best information I have been given was the similarity to the Ramsund Carving. I am sure this is just a modern copy of that carving. ” Yarmouth Rune Stone which looked fade to me. going around about your find even by way of a contraversy. a side trip from ther to see your stone . carve something like that on a trip like that would have been ? found has been fully recoreed and documented. Look at the meaning to the original “Sigurd Carving”. The meaning behind the carving is the story of “Sigurd” defeating “Fafnir” and on request of “Regin” had roasted “Fifnir’s heart. During the roasting “Sigurd” had burnt his fingers and placed them in his mouth with the residue from “Fafnir” heart on his hands. After he had tasted the blood of “Fafnir”, “Sigurd” started to understand what the birds were saying and they had warned “Sigurd” of “Regins” treachery and on that “Sigurd” had slain “Regin”. 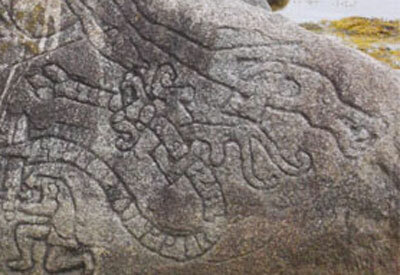 The runic lettering on “Fafnir” tells of ones accomplishments in life. These are “Memorial Markers”, created after the death of someone. Meaning they, too have learned the “Divine Language of the Birds” or “Language of the Angels”. Their name and accomplishments would have been written within the body of “Fafnir”. What you have is a memorial to an “unknown person or group” with a “noteworthy unknown task”. Hey there, I recently found this rock, not that easy and I can tell you that it’s runes are similar in nature to the Swedish Sigurd carving but some of the runes are clearly arranged in a different series than the Swedish Sigurd carving. Would you be able to tell me more about these ‘Memorial Markers’ and how you came to learn of them. Are you close to Halifax, N.S. ? I don’t know anything about Memorial Markers, I just tried to discover who carved this stone. Hello, I am sorry to say that I am not from Nova Scotia but rather from Kalamazoo Michigan, USA. I am a Oak Island theorist researching the Templar Knights coming to Nova Scotia pre 15th century. What would you like to know? what Anders Winroth, the Director of Graduate Studies in History at Yale and a well-published Norse expert said is that the stone was not carved by the original artist of the Ramsund Carving. As for the identification of the time period, I would like to know his reasoning for it being with in the 20th century. What are the determining factors besides it being brought up now. 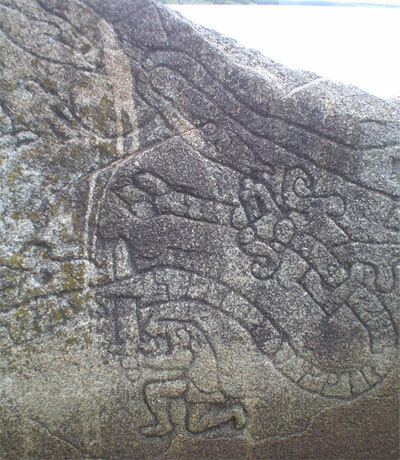 So why do you suppose the left side of the Sigurd Carving is missing from this rock? It’s the left half that describes much of the Norse Mythology you described. In this one it only depicts the horse, the dragon/serpent and a tree that should be in the middle with a bird on top, but I can’t quite make it out. But, in any event, this one doesn’t appear to be telling the same story as the Sigurd carving but the uncanny resemblance can’t be a coincidence. How does one date a rock carving anyway??? 🙂 I intend to take a day trip soon to go look at it myself. I think it’s fascinating, even if it was done by a local artist some time in recent history. It’s not about missing a piece of the whole. It’s about it being there in the first place. Do you want to know the answer? It’s a second marker……it’s onething to have a starting point but you also need a finish point. If I gave you the shape of a island isn’t just as important to know where the island is? Do you realize that there is a map to all this? No, i’m serious….there is a stone in the States that is the starting point and there was a map used in a book that the author had found in a collection of maps. The author had no idea what it was a map to but must have thought it would add to his book. The map is of the island and written on it dirrections. The funny thing is that the perimeter shape of the island matches one of the islands in Mahone Bay. Sir Henry Sinclair said his last voyage was to retrace the footsteps of his ancestors the Vikings. So I would assume he would follow many examples of the Vikings. So, if some great task was done I would exspect it to be marked with a stone like that. If you look at the carving closely the figure if Sigurd has a cross on his back. This is also not far from the New Ross Castle or Roslin. Thank you for pointing out the “Cross” on the back of the “knight”. I did not see that little feature. How many knight carried the symbol of the cross? I can only think of one, and having both “Christian Symbols” and “Viking Runic Symbols” thell me this stone was created after the Vikings voyages to the new world. Why create this stone with the “Cristian” symbol? 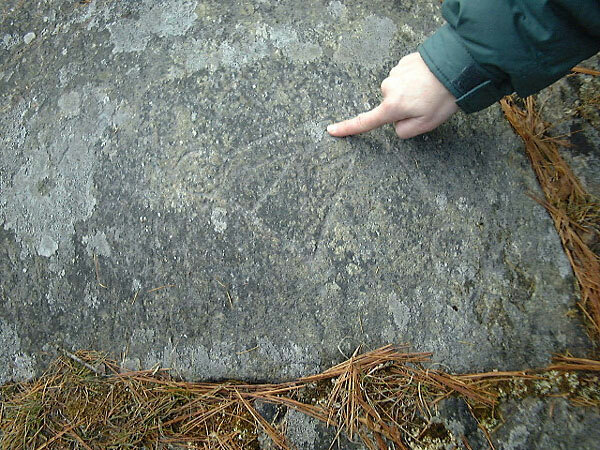 I would still say Templar Marker…..Has any of you seen the templar cross carved on a stone on the southwest end of Nova Scotia? I’m telling you folks it’s the marker which signifies the location to a “Island”. A island that was drawn by the Zeno brothers and the details filled in by Sir Henry Sinclair. A drawing that was later found by Harold Wilkins in the early 1900’s at the British Museum. He added feature to give it realism to aid in the sale of his book. Why did you copy my photos and say this stone was covered in moss and sea gull droppings? I don’t think you have been anywhere near this stone! The answers that I am telling you are based on my own research. Yes, it is of Oak Island and I have share some of this with the current investors of the”Money Pit”. I believe the hardest thing to do is get people to listen. Do you want to see a good example of the Templar’s in Nova Scotia? Look in Overton, there is another stone carving but it is a good representation of native indian/ Templar pictogram. It is the native indian symbol for Earth and its 4 points, North, South, East, West. The Circle with the cross is native indian symbol fo Earth but it has the Templar cross in it. Another oddity is in one of the tales of “Glooscap” one of his friends happen to have blue eyes and facial hair. Glooscap also taught them the game of I believe what is called Lacrosse. But you have to look at the game the Scotish played that dates back before christianity. It was called “Shinty”, and was a form of “field hockey”. Can you Email me at deveau at chebucto.ns.ca please? I would like to clear-up some confusion about this stone. Please share it publicly too! I’m fascinated by the carving and all of the mysteries cropping up out of my neighbouring Province: Oak Island, Mystery Walls, all kinds of goodies. I think you may want to consider that the age of these things are potentially much, much older than centuries. Maybe alter your perspective and add a couple zero’s? 🙂 When things don’t add up, usually that means there is a false assumption in the equation. Question those assumptions and see where it leads! No harm in thinking outside the box, right? Have we heard anything further on the date of this stone? THe stone contains a jumble of different elements that don’t belong together. North America is full of stones like this mostly made by immigrants to either amuse, mislead or make money. In the late 1800 s schoolchildren in Scandinavia all learned basic runes. And many Swedish and Norwegian stoneworkers found work here in the haydays of the stone industry 1890-1910. Exposure to saltwater and weather may help a stone like this look more weathered and older than it actually is. I would be cautious reading too much into this stone. 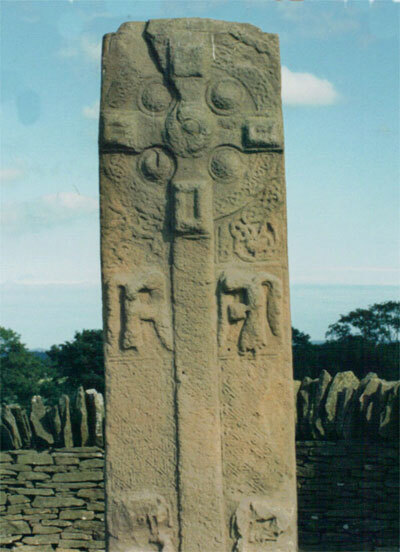 The Overton stone to me looks more authentic , although the cross may have been added later. It is likely by another “artist”. 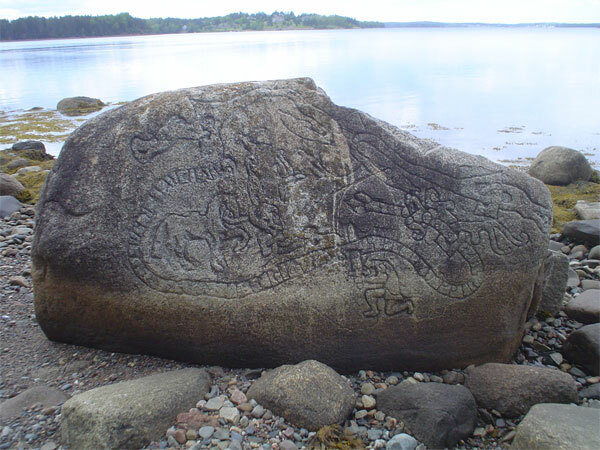 It is remarkably similiar to a tune stone found in Sweden in the 1800s; Both tell the story of Sigurd who slays a dragon with a manically sword he has had reformed. 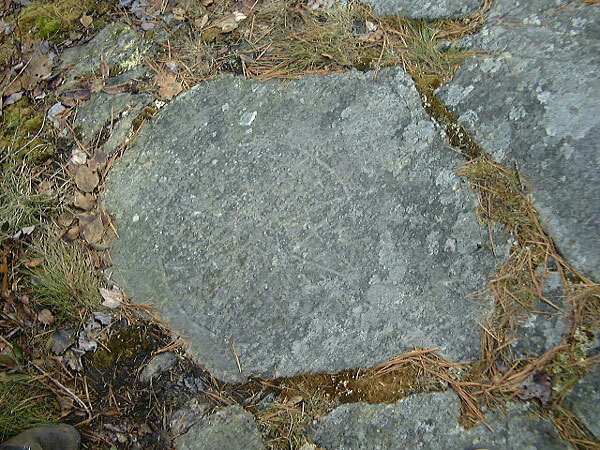 The stone you saw on the beach was carved by someone with knowledge of the Swdish rune stone as it is very similiar. 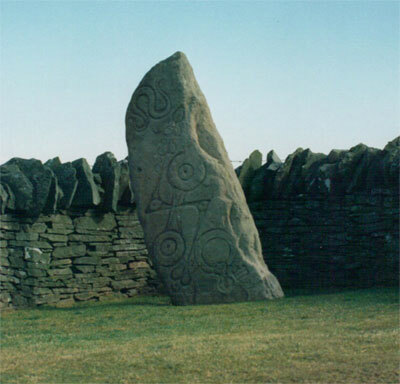 Google Norse stone carvings and you will see it. Yes, Patrick Hirtle said much the same thing and referred us to https://en.m.wikipedia.org/wiki/Sigurd_stones#S.C3.B6_101. I think it seems to be a copy of that. Do you have Latitude & Longitude for this rock? 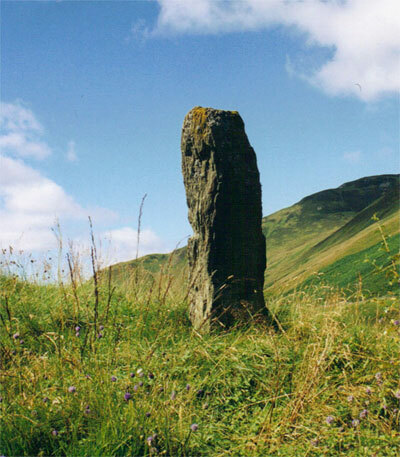 I’m writing an e-book on the Oak Island mystery for the site MysteriesOfCanada.com and was wondering if you might allow me to use your photo of the South Shore stone (with attribution, of course). If that would be alright, please let me know. I’d be pleased if you could find out anything else about this. Received this report from a friend who is a dowser and looked at the stone for me. I really suggest you look into the stories of “Enoch” from the Bible. He had something in common with “Sigurd”. They both spoke the language of the Birds or language of the angels. It was the Angel “Uriel” who had taken Enoch to where heaven and earth end and shown a “Great Abyss” …(To the West) and he was referring to “Purgatory”. You see “Sigurd” was shown favor by “Odin” as “Enoch” was shown favored by God. Enoch never experienced death, God had take Enoch to heaven and had given him the gift of speaking the secret language of the Angels. Enoch was believed to be the true right hand of God and he was believed to be the person who designed the pyramids of Giza and he had the gift of proficy, look at the back of a US dollar…Freemasons don’t speak a secret language but rather a language in secret…If “Hirahm Abiff” was the grand builder then took at the meaning of his name…”Hirahm” meaning “exalted brother” and “Abiff” meaning “My Father”. In the story of Enoch, Enoch had designed a underground vaults consisting of nine, one on top of the other and the entrance to each vault was through the arch. It was Enoch’s son who had built it as he had built the Pyramids. His name was Methuselah. He was the true “Grand Builder” and “Enoch was the Exalted Brother. Actually, Rosslyn Chapel has the answer to this stone and it’s quite clever…..
Look at the West side of Rosslyn Chapel, You will see a round window with a cross in it. It resembles the carving on the Overton Stone, of the Circle with a cross in it. Notice the depiction on the Norumbega Vinland stone, The depiction of the Norse legend of Sirgurd defeating Fafnir, but with a twist….Sigurd is wearing a “Cross”, depicting Christianity… Look at the “Green Man” in Rosslyn Chapel, one of the beliefs of the “Green Man” is that it’s representation of the Bridge between old and new “beliefs”. Just as Rosslyn Chappel is the link between Templar/Freemason. These Stone’s in Nova Scotia are the true “Shepherd of Arcadia”. Tobacco and Eagle feather carved into the stone were considered “Gifts from the Gods” by the “First Nation”. 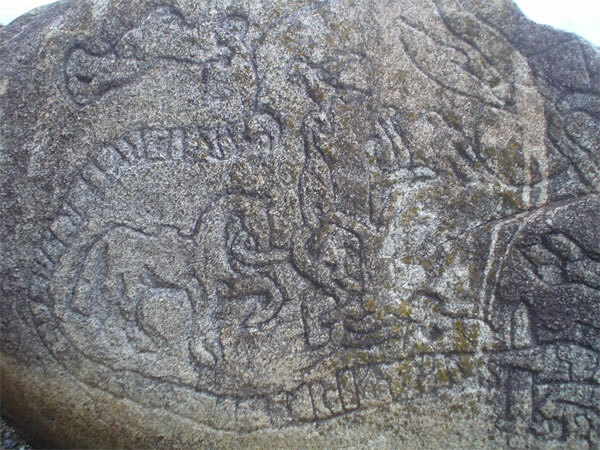 Look at the “Norumbega Vinland Stone”, the depiction of Sirgurd slaying Fafnir of Norse legend, what people fail to realize is that Sigurd also received a gift that only the God “Odin” possessed and that was the ability to speak the language of the birds. Also known as the Language of the angels or the “Green Language”. i just read your posts on Jan. 23, 2017, and I’m wondering if your blog is still being maintained. None of the posts show a year. If you are, I would appreciate knowing how recent the posts are. Hello, Do you mean this post in particular? It was written in 2012 and you will see that there have been a lot of comments over the years. I replied in the comments in August 2016, when a friend gave me his belief after dowsing the area. All the comments are dated.